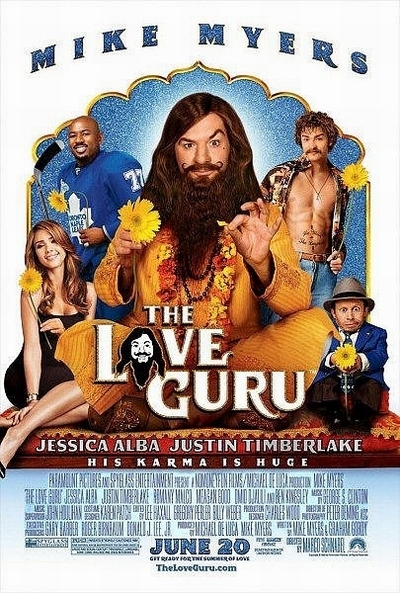 Story: In the comedy "The Love Guru," Pitka (Mike Myers in his first original character since Austin Powers) is an American who was left at the gates of an ashram in India as a child and raised by gurus. He moves back to the U.S. to seek fame and fortune in the world of self-help and spirituality. His unorthodox methods are put to the test when he must settle a rift between Toronto Maple Leafs star hockey player Darren Roanoke (Romany Malco) and his estranged wife. After the split, Roanoke's wife starts dating L.A. Kings star Jacques Grande (Justin Timberlake) out of revenge, sending her husband into a major professional skid - to the horror of the teams' owner Jane Bullard (Jessica Alba) and Coach Cherkov (Verne Troyer). Pitka must return the couple to marital nirvana and get Roanoke back on his game so the team can break the 40-year-old "Bullard Curse" and win the Stanley Cup.